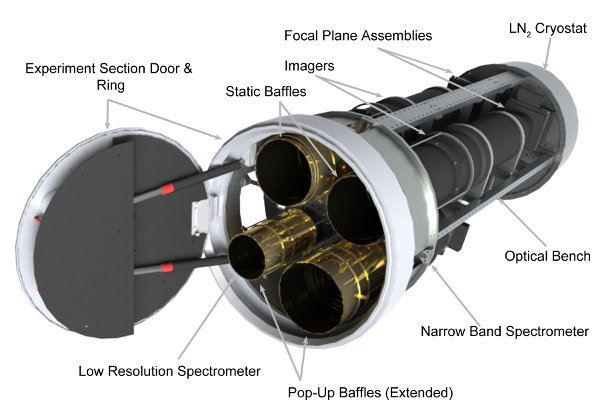 Wide-Field Imager measures extragalactic fluctuations on large angular scales. These angular scales are critical to detect the characteristic first-light galaxy power spectrum. Two spectral bands discriminate first-light fluctuations from foregrounds. Spatial resolution of 7" deeply removes galaxy clustering and shot noise. High sensitivity probes significantly deeper than the fluctuations reported by Spitzer and the IRTS. Narrow-Band Spectrometer measures the absolute intensity of the Zodiacal brightness using the reflected Ca II 854.2 nm Fraunhofer absorption line in order to test Zodiacal dust models. Compact imaging spectrometer detects theintegrated Ca II 854.2 nm line strength. High sensitivity measures the absolute Zodiacal brightness to < 1 % in 6 fields. Control systematic errors associated with the instrument to 3 % in order to compare with DIRBE J-band. Low-Resolution Spectrometer searches for the Lyman cutoff signature of reionization in the IRB. At the IRB level reported by the IRTS, such a bright feature would be apparent without any foreground subtraction. It will also measure the Zodiacal color. Absolute grating spectrometer measures in the spectrally unexplored 0.8 - 2.0 μm range between IRTS and HST.